Easy Assembly – no component weighs more than 50 pounds. Designed for receiving and preparing unit doses of high-energy radionuclides, these L-Blocks provide a choice of 1.5" or 2" thick lead shielding in front, and 1" thick lead in the base. 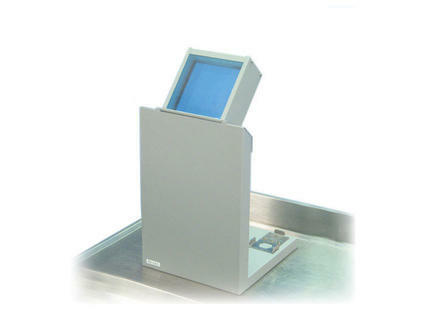 The L-Block feature an 8" x 8" x 4" lead glass window. A special plate with a hex-shaped recess is mounted on the base to facilitate one-handed loading and unloading of dose pigs incorporating hex-shaped bottoms. 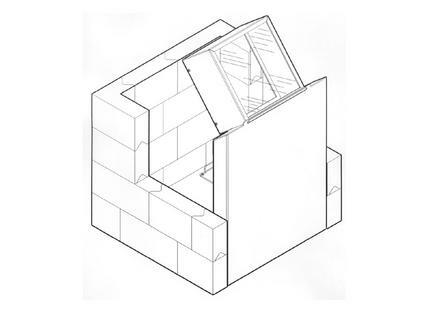 An optional Lead Brick Cave may be added to provide lateral shielding around the full perimeter of the L-Block's base. These L-Blocks are shipped in modular form for easy installation without lifting equipment. No component weighs more than 50 pounds. After placing the base frame in its location, pre-cut lead sheets are loaded into the horizontal and vertical portions of the steel frame. The window module is mounted, and assembly is completed by securing window unit and steel end cap with four Phillips head screws. A Phillips screwdriver is the only tool needed. Assembly instructions are provided. - 8" x 8" x 4"
Fits 042-449 and 042-419 L-Block Shields.